An injured man had to be airlifted from a hillside in the early hours of the morning after falling from a cliff edge in East Lothian. The man was with two friends who got into trouble at North Berwick Law at about 01:45. Members of the Borders Search and Rescue Unit used abseiling equipment to reach the group. The injured man was than winched from the scene and taken to hospital. 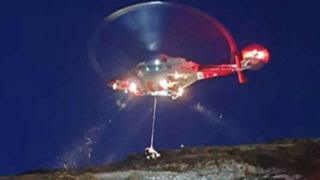 Fisherrow Coastguard tweeted a video of the rescue, which also involved the police and fire and ambulance services.. The other men in the group were able to walk off the hill and are not thought to have been injured.